A couple of weekends ago, Neal and I had the pleasure of visiting Blowing Rock, North Carolina. It is a beautiful town nestled on the mountains where strolling Main Street is a pleasure. As we walked along the sidewalks and peered into windows, we stumbled across a wonderful shop, “Bolick and Traditions Pottery.” North Carolina is a treasure trove for great pottery, and this shop was a find. Owned by Janet and Michael Calhoun, the shop unites three potters from the Owens Family: Bolick, Traditions, and the Original Owens Pottery. The Owens family of potters dates back to the mid-19th century. The family history marks generations of potters that have handed down their skills. The red pottery is outstanding as well as the traditional-colored pottery, but what really drew me in to the store was the blue pottery. As you all know, I have a passion for the color blue. So it should come as no surprise that I immediately went to the fabulous display and found many shades of blue that I adored. Neal and I each selected mugs from the blue assortment. Men love mugs with big handles, and Neal found just the fit. I admire beautiful pottery and can only imagine the thrill of seeing a piece start with the clay and, with several steps, become a finished piece. The shop is sure to become one of your favorite stops if you find yourself in the quaint village of Blowing Rock. Their website is www.traditionspottery.com if you would like to see their offerings. Do you collect pottery? If so, who is your favorite artisan? This is right near my hometown!!! I love Blowing Rock with all my heart. No matter where we vacation…it is my favorite. I have chatted with Janet several times and used to go listen to her father Glenn, who is a wonderful local storyteller when I was a little girl. Their pottery is unique and so beautiful. We recently purchased plates and just live the way they make dinner a little more special. I am so glad you enjoyed visiting there and thank you for blogging about it! 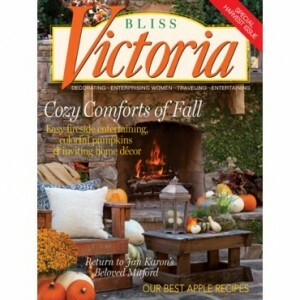 I would have had to come up and meet you…your magazines are my favorite in the world! Visited Miracle Pottery near Mentone, Alabama, this week. Ms. Miracle’s pottery is beautiful. Look at Mud Creek Pottery in Calvert, Texas. Sonny Moss, the potter, bought my great grandfather’s old cobbler shop, the added my grandfather’s old dry goods store, for a studio and gallery. Where buildings in between were torn down, he built an outdoor kiln and an area for relaxing, with an arbor and pipedin music. The larger store became a studio and gallery, and he hosted art classes in pottery and also workshops and classes in drawing and painting. Sadly, Sonny died a few weeks ago . Our family was so thrilled when he bought those buildings and turned them into places for art. I also taught art and Sonny helped me when I had questions about clay and even repaired my kiln for me, when there was no one available in our area. I grew up around that store, so it was always like being at home to visit a Mud Creek Pottery. Another potter who was a good friend and helpful to me was Joan Moore. She set up a wonderful pottery program at Texas A&M University in the Architecture Dept. Sadly, the powers that be got rid of her program and now as far as you can see, there are computers and the outdoor kiln she built is now a tool shed. She took early retirement rather than go into computers. She was also a terrific painter, and did much research into Native Americans and their art. The University also had a program where they taught pottery, painting, frame making, woodwor, jewelry, calligraphy, etc. But, again the powers that be did away with that program and made offices in that space. I used to take my students on field trips in the spring to see the galleries, the Architecture Dept., te MSC and the craft program, and the new Vz Lab, where graduate students prepare for careers with Disney, Pixar, etc. I do collect a few pieces from different potters. Another potter whose work I liked was Winston Sanders of Hearne, Texas. I love to shop for clay and related materials at Armadillo Clay Co. in Austin, Texas. I wasn’t too interested in doing clay work. I didn’t like getting my hands in the clay and all the mess it made. But, one year, I thought I would try to learn to use some of he tools we had at school. My boyfriend felt bad and stretched out on my couch to watch tv. So I did a clay head of him. Turned out to be perfect. Put it in an art show and won first place. But I didn’t know that it should be hollowed out and fired! Instead, I put some liquid metal over it. Not very protective, but looked nice. Eventually, it got dropped and all I had was dust! Later, with workshops and the help of artist friends like Joan and Sonny, I learned more. My favorite thing was making clay heads out of 25 to 50 pound blocks of clay. Another person who I learned a lot from was Anne Armstrong, sculptor from Houston. I was only able to see one demo by her, but I learned so much. I went to one workshop at the Horticulture Dept. at A&M where an artist taught some creative techniques with clay, but do not remember the artists name. I would learn things at workshops and classes, and go back and teach some of those things to my students. When I retired from teaching, I lost access to the kiln, etc., and now I don’t have the strength to do a lot of pottery. Since I lost my center vision, my sister thought I might like to do some work in clay. But she bought me a little “bowl” of clay from Hobby Lobby. That is just too tiny for me! There are several excellent potters in the Bryan/College Station area, and certainly in Houston and surrounding areas. I’ve seen some really good work at the Salado Art Fair, another nice little town to visit, with lots of art work, antiques, etc. 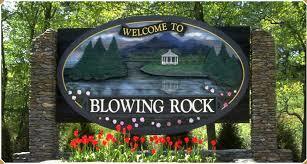 I’m so glad you found Blowing Rock, NC. Others have mentioned Seagrove, NC as well and I would echo their recommendation to visit the potters of Seagrove. I have been doing pottery for about 10 years as a hobby and I find it to be a life saver. Working with clay puts me in touch with nature and allows some creative juices to flow that I didn’t know I had. I would encourage anyone who can find a class, most community colleges have them, to give it a try. The red pottery made by Ben Owens is some of the most beautiful pieces ever created, and very difficult to do. Thanks for blogging about my home state! 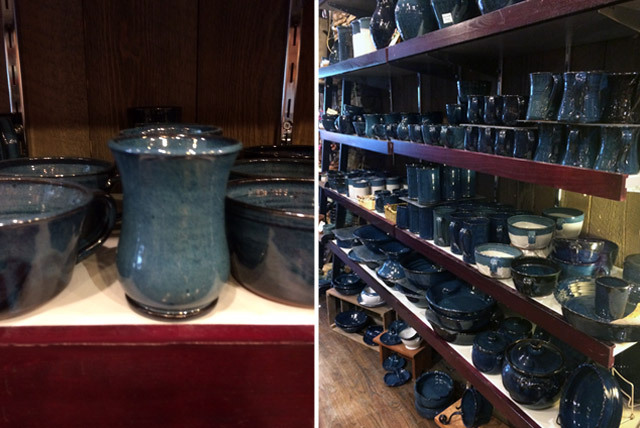 Seagrove Pottery in the Seagrove Area of NC has so many shops, including the gorgeous red glaze pottery of Ben Owen. If you really love pottery, sometime you need to visit Seagrove, NC a treasure trove of potters & their work. Eric and Barbara Haville in Branchport, NY make some really neat pottery! My friend, Barb, collects the blue pottery and she likes the ease of clean up for the casserole dishes. I just enjoy how pretty it looks on the table! I echo Linda’s comments on McCarty’s Pottery in Merigold. I have several pieces from the early days of its existence, as well as more recent ones. Just up the road in Mound Bayou is Peter’s Pottery. Peter was trained by the McCartys, and his pieces are similarly attractive. These two potteries are my favorites. I have also some blue bowls I like from JB Calhoun Traditions in Blowing Rock. Sadly my Rebecca’s jar/jug from Blowing Rock is broken, and I’d love to replace it some day. Me too Karen. I’m glad they are still throwing pots after 30 plus years!! In the Mississippi delta, there is a tiny town called Merigold. Partially hidden by tall and running plants is McCarty Pottery. Lee McCarty (90 plus? yrs old) and his nephew make gorgeous pottery in blue, nutmeg, or pale aqua. His late wife was the brilliant designer. Many pieces feature a dark, squiggly line representing the Mississippi River. Mr. McCarty sometimes graces the store with an appearance, but he always retires upstairs for a nap at 1 pm! I have collected the blue pottery for years and the many pieces make our gathering room come alive. Down the street from the shop is a lovely little restaurant, also Mr. McCarty’s. All the tableware is McCarty pottery. The menu consists of two or three choices, all delicious. Locals know that secret recipe hot tamales can be purchased to go! A visit to Merigold makes a great day trip. Once our grand baby was with us, and Mr. McCarty gave her a bird for a keepsake; we always take him a gallon of Mississippi State buttermilk (which cures all manner of sickness or sadness, according to the potter!). My sister and I both collect “Motto Ware” pottery. It was made in Devon England in the early 1900’s. The pieces that we collect have cute little houses with trees on the front. On the back, it has darling sayings, such “Don’t worry for it may never happen”. It also was painted with a rooster, kingfisher, seagull,and fleur de leis. They stopped making it after World War II. My mother brought over a tea set which was a wedding gift when we came from New Zealand to America. That tea set started our collection. Steve Coburn makes beautiful pottery in Salina, Kansas. I collect his dark blue and blue and green pieces. The deep, dark blues are really gorgeous. Check out his website at stevecoburnpottery.com – and the dark, rich blues in the pictures are really how the pottery looks in real life. My very favorite potter is Sherry Lutz of Only Original Art from the Folsom, Louisiana area. I have given a lot of her pottery as gifts and have quite a few pieces. To choose your favorite potter oIs like choosing your favorite child! Each pot and potter is unique and delightful!!! Be forewarned. On e you pick your first peace of pottery, you’re hooked and headed for an adventure of discovery! I collect Janet Williams pottery from Paseo Pottery in Santa Fe, NM. I started my collection about 4 yrs. ago & have added pieces each time I visit. Her work is exquisite! While I don’t collect pottery from one particular artisan, I do like to buy pottery from individual booths that are set up at festivals and one of a kind shows. I have unique Ukrainian, Polish and Portuguese pieces…each reflecting both the cultural background and the talent of the creator. I also love blue and the pottery you found in Blowing Rock looks beautiful.